We are committed to keeping this blog active throughout 2018 with writing, art, music, interviews, news reports, poetry and updates of what our members are doing throughout the year. Samad has joined Writing Through Fences as our website administrator to work alongside Gary. He will be working from PNG where he has been detained indefinitely for more than 4 years. 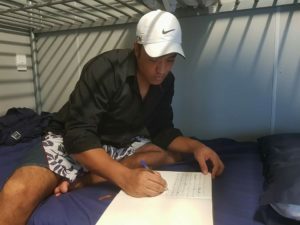 His job will include updating our website and keeping the blog active with writings, reports, poetry, music, art and other happenings from people who are affected by Australia’s immigration policies. My name is Samad and I’m from Pakistan. I have been detained illegally for years in a place where it’s so easy for hope and dreams to be demolished. I wasn’t a writer but this place made me a writer. My pain made me a writer. Although I can’t take my dreams from the people who destroyed them I will use my words as a weapon and will not allow them to destroy more dreams. I completed high school and then went on to do 2 more years of general studies in the Faculty of Science. I also studied some Basic Engineering and attended English classes before I was forced to flee my homeland. I became interested in writing when I came here to PNG. When there isn’t anyone with me I always write. My strength is in my hope of building a great image of a great future in my thoughts. I want to study Human Rights and be a social worker / advocate for women and girls rights in my country. My culture denies them their rights. I have written a short piece about my passion for the rights of women and girls in his country. It is included in this first blog of 2018 and titled: My Dream. It might be so normal for lots of people who see a bird to be captured by some one but the way the innocent bird is crying, do we feel the pain? The society where I lived, has plenty of innocent birds and those beautiful birds are girls, who want support, motivation, positivity, freedom and education but we have failed to give them their fundamental rights. It’s just normal for the majority of people and unfortunately they are proud of themselves for not allowing girls to have their fundamental rights. There are still lots of people who believe giving birth to a baby girl is a big shame. How can a girl survive in a society where a boy is allowed to do what ever he wants but a girl is strictly denied? Since childhood, girls have been told, ‘why would you want to study when you will end up with marriage life when you turn 16 and you will look after the kids for the rest of your life?’ That is the big excuse made by a culture centuries ago and the majority are happy with that. Her life decision is under her parents or elder brothers control until she gets married. After marriage she will be expected to do what her husband tells her to do. She can’t go alone anywhere, she can’t make life decisions, she is not allowed to work, she’s always expected to accept the unacceptable. That’s how the girls are surviving in my society. I want the girls in my society to be proud, to be motivated, to be supported, to be educated and my biggest dream is to sacrifice my life for them and fight against that part of my society, and for girl’s and women’s freedom.